Browning Day Mullins Dierdorf, Inc.
Lucas Oil Stadium is a multi-purpose stadium in downtown Indianapolis, United States. It replaced the RCA Dome as the home field of the NFL's Indianapolis Colts. The stadium also hosted Super Bowl XLVI in 2012. The stadium had its ribbon-cutting ceremony August 16, 2008, and then officially opened to the public eight days later on August 24, 2008. The stadium was constructed to allow the removal of the RCA Dome and expansion of the Indiana Convention Center on its site. The stadium is on the south side of South Street, the block south of the site of the former RCA Dome. The stadium is often referred to as "The House That Manning Built", even though Peyton Manning no longer plays for the Indianapolis Colts. In addition to serving as a football stadium, Lucas Oil Stadium is also the well-known site for two famous music competitions in the United States: the Bands of America Grand National Championships, which feature some of the highest achieving high school marching bands, and the Drum Corps International Championships. Both organizations serve corps style bands. On February 28, 2006, prior to the construction of the stadium, Forrest Lucas announced that Lucas Oil had purchased the naming rights for $121 million over 20 years. The architectural firm HKS, Inc. was responsible for the stadium's design, with Walter P Moore working as the Structural Engineer of Record. The stadium features a retractable roof and window wall, thus allowing the Colts to play both indoors and outdoors. The implementation of these elements of kinetic architecture provides for quick conversion of the facility to accommodate a variety of events. The field surface is FieldTurf. The exterior of the new stadium is faced with a reddish-brown brick trimmed with Indiana Limestone, similar to several other sports venues in the area such as Bankers Life Fieldhouse, Hinkle Fieldhouse, and the Fairgrounds Coliseum. The architectural style complements other older structures in the downtown area. Seating capacity for football games is 62,421; an increase of more than 5,000 over the RCA Dome. For football, the stadium can be expanded to a capacity of 70,000 for large events, such as the Super Bowl. The stadium's basketball configuration can exceed the 70,000 minimum seating capacity required to host the NCAA Final Four. Lucas Oil Stadium offers 137 luxury suites, including 8 field suites, and 12 super suites. In addition, it contains the Quarterback Suite, a semi-private 200-seat party room. The stadium contains two massive high definition scoreboards, each one 97 feet (30 m) wide and 53 feet (16 m) tall, which are situated in the northwest and southeast corners of the stadium. Lucas Oil Stadium has a retractable roof designed by Uni-Systems that, like the Veltins-Arena, divides lengthwise into two retractable panels, with each half sliding down the sloping roof of the stadium into the open position. The stadium roof is gabled, with the peak in the center of the field, paralleling the sidelines. A cable drum drive system drives the retractable roof panels up and down the sloped track. Rather than dragging the 1½" diameter galvanized cables across the fixed roof, this system's patented design lays the roof cable down, and then picks it back up. In nine minutes, the roof panels will simultaneously move to the open position at the touch of a button. To guard the stadium's interior from weather conditions the roof is designed with a large cap that will run the length of a sealed overlap between the parting roof panels. Just beneath the sealed overlap is a large trough, finalizing the retractable roof's layers of protection. It is the only retractable roof in the country with two moving panels that will meet in a peak above the center of the stadium. The roof boasts the largest opening—a 4.5-acre (1.8 ha) hole to the sky—of all current and planned NFL stadiums with retractable roofs. The Lucas Oil Stadium retractable roof system is operated by 32 cables, each 1½" in diameter, with galvanized right and left hand lay. They were manufactured specifically for this project by Wire Rope Corporation of America and furnished by The Tway Company Inc. located in Indianapolis. The lengths vary from 232’6" to 245’ and include a Johnson Wedge Socket installed on one end that terminates the cables at the roof peak 288’ above the stadium floor. The home team determines if the roof is to be opened or closed 90 minutes before kickoff. The roof remains open unless precipitation or lightning is within the vicinity of the stadium, the temperature drops below 40 °F (4 °C), or wind gusts are greater than 40 miles per hour (64 km/h), in which case the roof operators will close the roof. Once the roof is closed, it is not allowed to be reopened. A large windowed gate at the northern end of the stadium allows additional light while closed and allows for a more open feel while open. It was the largest movable glass wall in the world until AT&T Stadium was completed. The transportable window wall is 244 by 88 feet (74 by 27 m), and composed of six 88 ft (27 m) × 38 ft (12 m) glass-clad panels. Each panel rides on a steel rail while the wall opens and closes, and is supported by two hardened steel wheels. The window separates at the center, with three panels amassed on each side when in the open position. The six wall panels move simultaneously during opening and closing in six minutes. The windows seal when closed, fully shielding building occupants from all weather conditions. The retractable window offers a view of downtown Indianapolis during games, concerts and other events due to the stadium's angled position on the city block. The four gates leading into Lucas Oil Stadium are each named for sponsoring corporation: Lucas Oil, Verizon, HHGregg, and Huntington Bank. The ground-level concourses of their respective gates are feature banners and floor coverings with the corporations' logos, advertisements and merchandise displays. Each corporation is reported to have paid in excess of $1 million. Lucas Oil Stadium and the city of Indianapolis made a bid to host Super Bowl XLVI in 2012. On May 20, 2008, the bid was successful, defeating Houston, Texas and Glendale, Arizona for that right. In July 2012, Indianapolis mayor Greg Ballard announced that the city was intending on hosting another Super Bowl in 2018. The stadium is also host to the annual NFL Scouting Combine in February. The 2008 NFL season featured the first NBC Sunday Night Football game of the season in the stadium, as the Colts faced the Chicago Bears in a rematch of Super Bowl XLI. The Colts lost the game 29-13. Indianapolis won its first 2 NFL playoff games held at Lucas Oil Stadium, beating the Baltimore Ravens 20-3 in a 2009 AFC divisional playoff and the New York Jets 30-17 in the 2009 AFC Championship Game to reach Super Bowl XLIV. The stadium hosted the semifinal and final rounds of the Men's Final Four in 2010, 2015 and will in 2021, with the Women's Final Four scheduled to be hosted there in 2016. Historically, Indianapolis has been a popular choice for the Final Four. The NCAA has its headquarters there, and the event comes on a 5-year rotation. Also, the Big Ten Conference has played the Big Ten Football Championship Game at Lucas Oil Stadium since its inception in 2011. In the inaugural edition on December 3, the Wisconsin Badgers defeated the Michigan State Spartans 42-39. The first games played at Lucas Oil Stadium occurred on August 22, 2008 and were part of the PeyBack Classic, featuring Indiana High School Football games played between Noblesville High School and Fishers High School in Game 1, followed by New Palestine High School and Whiteland Community High School in Game 2. On November 26, 2008, Cardinal Ritter High School became the first high school to win a state championship on the field, beating Sheridan High School 34-27 for the class A state title. The stadium hosted its first soccer game on August 1, 2013, when England's Chelsea played Italy's Inter Milan in a first-round game of the International Champions Cup, drawing almost 40,000 fans. Drum Corps International (DCI) announced on August 9, 2006 that it would move its corporate offices to Indianapolis and that the DCI World Championships would be the inaugural event for the stadium and would be held at Lucas Oil Stadium every year through 2018. Because the stadium would not be completed in time, DCI announced on April 4, 2008 that it would move the event to Memorial Stadium on the campus of Indiana University for 2008. The competition was held for the first time at Lucas Oil Stadium in 2009. Other regular events include the Bands of America Grand National Championships and the Indiana Marching Band State Finals, both major events for the city in Marching band competitions. The Drum Corps International World Championships are scheduled the site annually through the 2018 season, and the Circle City Classic that is an annual American football game featuring two historically black colleges/universities (HBCUs) that is held in October. On September 13, 2008, country music singer Kenny Chesney held the first public concert at the stadium. Groundbreaking for the stadium took place on September 20, 2005. It was originally referred to as Indiana Stadium until Lucas Oil purchased the naming rights. 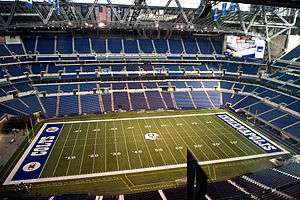 The total cost of Lucas Oil Stadium was $720 million. The stadium is being financed with funds raised by the State of Indiana and the City of Indianapolis, with the Indianapolis Colts providing $100 million. Marion County has raised taxes for food and beverage sales, auto rental taxes, innkeeper's taxes, and admission taxes for its share of the costs. Meanwhile, there has been an increase in food and beverage taxes in the 8 surrounding doughnut counties (with the exception of Morgan County) and the sale of Colts license plates. The County Commissioners of each county voted whether to levy the 1% food and beverage tax proposed by Marion County. Sweetening the deal for the those counties was the fact that half of the revenue from the tax would stay in the respective county. Morgan County was the only county to turn down the offer, yet in a later vote, it levied its own 1% tax – thus keeping all of its additional generated revenue. In August 2006, the Capital Improvement Board, which operates the stadium, estimated that daily operating expenses of the new stadium would be $10 million more per year than the RCA Dome. The board urged the Indiana General Assembly to authorize funding to cover the shortfall. The Indiana Legislature considered a bill to raise sales taxes statewide to cover the shortfall, however this plan faces stiff opposition from legislators outside the Indianapolis metro area. The assembly ultimately authorized a tax increase in Indianapolis-Marion County. In addition, the CIB trimmed staff and cut $10 million from its budget. Still, the agency anticipated a $20 million operating deficit for Lucas Oil Stadium in 2009. Anticipated expenses are $27.7 million—far outstripping the $7.7 million CIB expects to collect from its share of revenue from stadium events. The Colts organization has been criticized for the favorable lease terms and the high percentage of revenue it can keep under the terms of its agreements with the stadium authorities and there have been calls for the team to cover the shortfalls of the CIB. The Colts responded to these criticisms in an open letter to fans on September 16, 2009. On September 8, 2013 after the Colts defeated the Oakland Raiders in the season opener, a rail over the opposing team tunnel collapsed injuring two fans. One fan was transferred to the hospital for evaluation. No serious injuries were reported. On September 3, 2015, three fans were injured by a bolt that fell from the roof of the stadium as it was being opened during an NFL preseason game against the Cincinnati Bengals. The stadium was pronounced safe by officials, but the roof was to remain closed for events until a final investigation was completed as to why the bolt fell. ↑ "About ISCBA". State of Indiana. Retrieved January 10, 2012. ↑ Chappel, Mike (August 1, 2012). "Indianapolis Colts: Team Will Turn to Single-Game Tickets in Chase for Sellouts". The Indianapolis Star. Retrieved September 6, 2012. 1 2 3 "If You Build It..." (PDF). The Indianapolis Star. Retrieved January 10, 2012. 1 2 3 4 5 6 "Facts and Information". Lucas Oil Stadium. 2008. Retrieved January 10, 2012. ↑ "Lucas Oil Stadium". A2SO4. Retrieved January 10, 2012. ↑ "Lucas Oil Stadium". Browning Day Mullins Dierdorf, Inc. Retrieved February 6, 2014. ↑ "Lucas Oil Stadium – Home of the Indianapolis Colts". John Klipsch Consulting LLC. Retrieved February 6, 2014. ↑ "Lucas Oil Stadium". Emporis. Retrieved January 10, 2012. ↑ "Super Bowl XLVI/Lucas Oil Stadium". ArchDaily. Retrieved October 19, 2012. ↑ "Indianapolis International Airport Receives the 2009 Monumental Award". Kibi.org. November 19, 2009. Retrieved October 19, 2012. ↑ "Iscba Announces Lucas Oil Stadium Grand Opening Events" (Press release). ISCBA. June 23, 2008. Retrieved January 10, 2012. ↑ "Lucas Oil Gets Stadium Naming Rights, Colts Confirm". WRTV. wrtv.com. March 1, 2006. Retrieved January 10, 2012. ↑ Ingerson, Meagan (November 26, 2007). "Lucas Oil Stadium Scoreboards: 53 feet high, $11.4M Pricetag". The Indianapolis Star. indystar.com. Archived from the original on November 28, 2007. Retrieved November 26, 2007. 1 2 3 "Lucas Oil Stadium". Uni-Systems. Retrieved January 10, 2012. ↑ "Super Bowl XLV Visitor Guide: Stadium". NFL. Retrieved January 10, 2012. ↑ "HHGregg Signs On As Lucas Oil Stadium Founding Sponsor". SportsBusiness Daily. sportsbusinessdaily.com. December 11, 2007. Retrieved January 10, 2012. ↑ Callahan, Rick (July 19, 2012). "Indianapolis to make bid for 2018 Super Bowl". Yahoo! Finance. Retrieved October 19, 2012. ↑ Milz, Mary (March 31, 2008). "Colts Season Opener Puts New Stadium in National Spotlight". WTHR. wthr.com. Retrieved January 10, 2012. ↑ "Montee Ball's Four Touchdowns Spark Wisconsin to Big Ten Title". ESPN. Associated Press. December 3, 2011. Retrieved January 10, 2012. ↑ "Lucas Oil Stadium Preparing For Grand Opening Events". Indiana Stadium and Convention Building Authority (Press release). Inside Indiana Business. June 24, 2008. Retrieved January 10, 2012. ↑ "Drum Corps International Moving Headquarters, Bringing World Championships to Indianapolis" (Press release). Drum Corps International. August 9, 2006. Retrieved January 10, 2012. ↑ "2008 Drum Corps International World Championships Relocated to Indiana University" (Press release). DCI. April 4, 2008. Retrieved January 10, 2012. ↑ "2011 Grand National Championships Review" (Press release). Music For All. 12 November 2011. Retrieved January 10, 2012. ↑ Bradner, Eric. "Bands Take the Field at Lucas Oil Stadium for Annual Competition". Evansville Courier & Press. courierpress.com. Retrieved January 10, 2012. ↑ "Chesney Concert Will Be First at Lucas Oil Stadium". WTHR. wthr.com. September 16, 2008. Retrieved January 10, 2012. ↑ Eschbacher, Karen (August 27, 2006). "Operating in the Red Zone: Stadium Plan Faces Shortfall on Day-to-Day Costs". The Indianapolis Star. Pacer Digest. Retrieved January 10, 2012. ↑ "CIB President: Stadium Could Close If Deal Isn't Reached". WRTV. April 3, 2009. Retrieved January 10, 2012. ↑ Olson, Scott (September 15, 2009). "More Layoffs, Furloughs Possible for Cash-Strapped Indianapolis CIB". Indianapolis Business Journal. Indiana Economic Digest. Retrieved January 10, 2012. ↑ "Colts Letter to Fans on Lucas Oil Stadium". WTHR. wthr.com. September 16, 2009. Retrieved January 10, 2012. ↑ Bonesteel, Matt (September 4, 2015). "Three fans injured during Colts game after bolt falls from Lucas Oil Stadium roof". The Washington Post. Retrieved September 19, 2015. ↑ "Officials: Lucas Oil Stadium safe for events with roof closed, bolt investigation continues". Fox 59. fox59.com. September 18, 2015. Retrieved September 19, 2015. Wikimedia Commons has media related to Lucas Oil Stadium.